There's no understating it: Solid-state drives are awesome. If you’re still using a mechanical hard drive on your computer, the biggest real speed boost you’ll see comes from upgrading to a solid-state drive (SSD). A solid-state drive will speed up everything that requires disk access, from boot times and application launches to in-game load screens. Upgrading to a SSD provides a more noticeable speed boost than a $1000 Nvidia Titan graphics card when doing most things. But SSDs aren’t the perfect replacement for a mechanical hard drive just yet, thanks to their far higher per-gigabyte costs compared to traditional drives and a few unique quirks. Read on for tips and tricks on how to put that rip-roaring SSD speed to best use. Boiled down, an SSD is (usually) a faster-but-smaller drive, while a mechanical hard drive is a larger-but-slower drive. Your SSD should hold your Windows system files, installed programs, and any games you're currently playing. If you have a mechanical hard drive playing wingman in your PC, it should store your large media files, productivity files, and any files you access infrequently. Hard drives are an ideal location for your MP3 library, Documents folder, and all those video files you’ve ripped over the years, as they don't really benefit from an SSD's blinding speed. You’ll probably want most of your programs on the SSD so they'll load lickety-split, although large programs you rarely use are well-suited to a slower mechanical hard drive. When installing a program, choosing the destination drive for it is easy: Just select an install location on another drive. 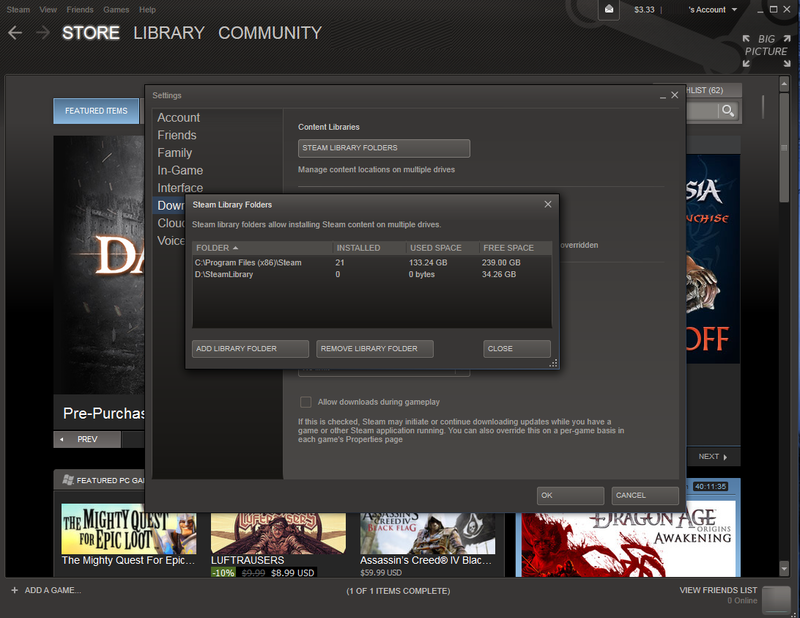 Adding new folder locations for game installations is dead simple in Steam—just open Steam’s Settings, select Downloads, click the Steam Library Folders button, and add a new folder on a different drive. Moving programs after the fact is often more difficult. Some programs can be moved easily—for example, you can just move your entire Steam folder to a new drive and run the Steam.exe file to launch it. However, most programs will display errors if you attempt to drag and drop their folder to a new location. You’ll either need to uninstall and reinstall the program to the new location, or use symbolic links. Symbolic links (or "symlinks") will allow you to move a directory while “tricking” Windows into thinking it’s at its original location. 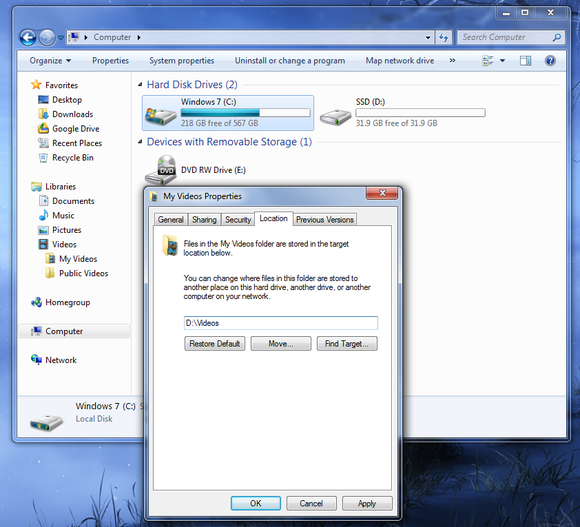 This sort of trick allows you to move your installed programs and games without much trouble. Say you have a game installed at C:\Game. You could move the game folder to D:\Game and create a symlink that points from C:\Game to D:\Game. Whenever a shortcut, registry entry, or anything else looks up C:\Game, the system will transparently redirect it to D:\Game. The symlink is just a pointer that says “hey, look over there,” so the program won’t take up any space on your SSD. Your main user data folders can be moved easily. To move your Videos folder from your main system drive, an SSD, to a mechanical hard drive, just locate the Videos folder—you’ll find it in your user folder at C:\Users\NAME. Right-click it and select Properties, then open the Location tab and select a new location for it. The Videos folder will still appear at C:\Users\NAME\Videos and be part of your Videos library, but its contents will be stored on the other drive. This also works for your Music, Pictures, Documents, and Downloads folders. While moving other folder types from a hard drive to an SSD can be a pain, Windows makes moving user data folders dead simple. Just click the Move button here! You can also choose the drive in which Windows itself is installed—you'll want it on your SSD for lightning-fast system performance. If you’re setting the PC up from scratch and installing Windows yourself, click the Custom option in the installer and choose your SSD as the destination. 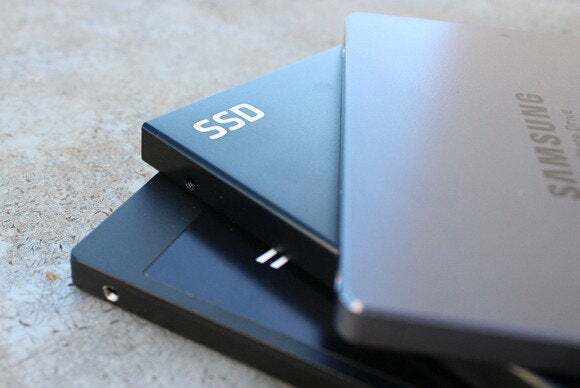 If you’re getting an SSD later, you can move your Windows install to a new drive with a drive-cloning program, or just reinstall Windows (after backing everything up, of course). SSDs slow down as you fill them up because the drive will have a lot of partially filled blocks, which are slower to write to than empty blocks. It’s tempting to fill up an SSD to the brim, but you should leave some free space on your SSD—plan on using a maximum of 75 percent of the drive’s capacity for the best performance. CCleaner can help you find and eradicate junk on your SSD, like Nvidia's driver installation files and browser cookies. With space at a premium, you’ll want to regularly free up space and avoid wasting those precious flash memory cells on junk. For example, NVIDIA’s graphics driver updates leave an unnecessary folder under C:\NVIDIA after you install them. 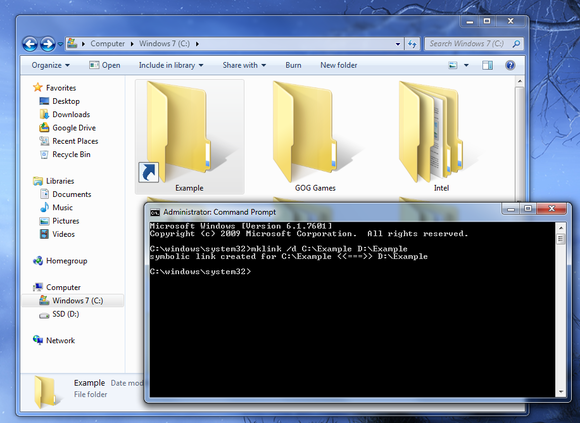 This folder contains the installer files, which you’ll need only for reinstalling or repairing the driver. They take nearly 500MB of space that you could put to better use. 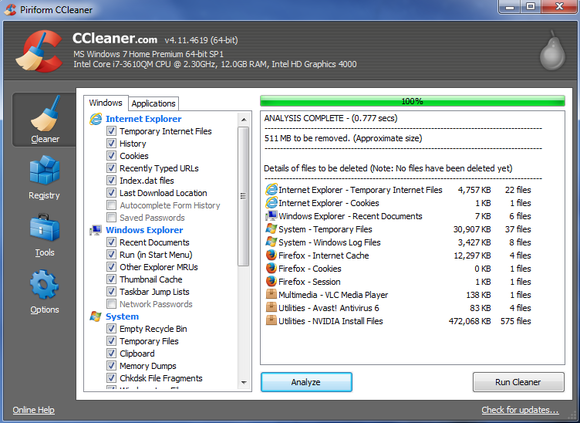 A tool like the free CCleaner can help tremendously, scanning your hard drive for unnecessary temporary files and deleting them for you. Meanwhile, WinDirStat is an ideal tool for figuring out where your storage space is going. Reduce writes to your SSD? It's true: SSDs only have a limited amount of writes before they start to fail. Yes, it sounds scary, but in practice, don't sweat it. You’ll get many, many, many years of normal use out of an SSD without bumping into its write-cycle cap—especially if you're storing basic media and productivity files on a mechanical hard drive. And even if you're not doing that, you're probably more likely to buy new hardware long before your SSD packs it in. You could achieve fewer writes by not saving temporary files to your SSD—for example, you could redirect your browser cache and PhotoShop scratch disk to a mechanical hard drive—but this will lead to slower performance when your system needs to access these files. You’re probably better off sucking it up and accepting the greater amount of writes for the increased performance. You shouldn’t defragment an SSD. Period. Shuffling all those bits around on an SSD won’t improve performance like it will on a mechanical hard disk, but it will generate many extra writes that will reduce the lifespan of the drive. Modern defragmentation tools and operating systems should refuse to defragment a solid-state drive. However, old defragmentation programs may not know the difference and may happily defragment an SSD. Don’t let them! 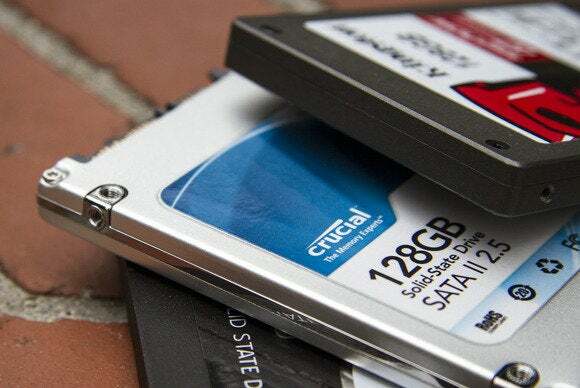 TRIM, however, is essential for keeping your SSD in tip-top shape. When writing data, the SSD can write only to empty sectors. This means if an SSD needs to modify a filled sector, it has to read it, note the contents, modify them, erase the sector, and write the modified contents. If we wanted to overwrite a sector, we’d have to erase the sector and write the new contents to the now-empty sector. The extra steps take time. Operating systems typically just delete a file by marking its data on the disk as deleted and erasing the pointer to it. The file’s data is still there on the disk, but it will be overwritten only when the operating system needs that “empty” space to write new files to the disk. The TRIM command tells the SSD to erase and consolidate cells that are no longer in use, so writing to those sectors in the future will be just as fast as when the drive was new. If not for TRIM, writes would take longer, and an SSD’s performance would deteriorate as you filled it up and deleted files from it. 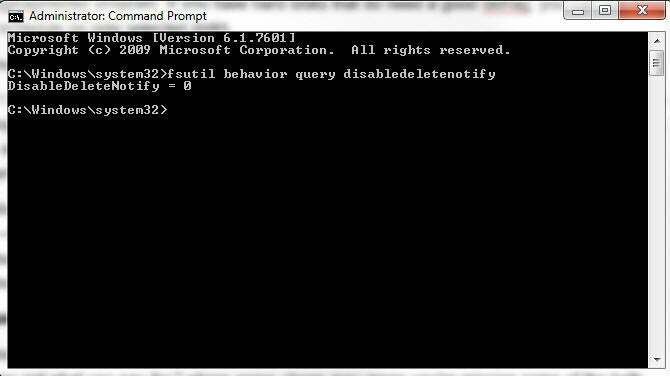 To confirm that TRIM'S enabled on your WIndows 7 or 8 PC's SSD, open the command prompt and type fsutil behavior query disabledeletenotify (without any end punctuation). If you get 'DisableDeleteNotify = 0' as a response, you're set. If you don't, confirm that your SSD drivers are up-to-date. Windows 7 and onward has had TRIM enabled by default, so there’s nothing special you need to do if your PC is using one of these newer OSes. TRIM won’t work on Windows Vista or Windows XP (you've upgraded from XP, right?). You'll need to use third-party SSD management software (like Samsung's SSD Magician or Intel's SSD Optimizer tools) to force TRIM on those operating systems, or the trick outlined in PCWorld's guide to restoring an SSD to peak performance. Unless you need to force TRIM on an older OS, however, skip the “SSD optimization” software that's out there. These programs promise to optimize your SSD by shuffling files and running TRIM, but your operating system already TRIMs by default, and your SSD's firmware has "garbage collection" tools that performs housekeeping tasks to optimize performance. There’s no evidence a third-party utility can improve on this. The good news is that SSDs are getting bigger, cheaper, and ever-longer-lasting. One day we’ll hopefully have large-enough SSDs that we won’t have to worry about juggling files between drives. Heck, if you don’t need much local storage or don't mind spending top dollar for abundant speedy solid-state storage, that day may have already arrived.